The original Port des Morts light was built on Plum Island in 1846. Maritime interests complained that the light was too far west into the Deaths Door Passage and that light further east and south would be more useful. The Lighthouse Board recommended a change in location, and on May 28, 1858, President Buchanan reserved the 3.5 acre island then known as Port du Morts from the public domain for a lighthouse site. In 1858 the Port des Morts Light was rebuilt on Port du Morts Island as a two story rectangular, cream-colored brick dwelling. 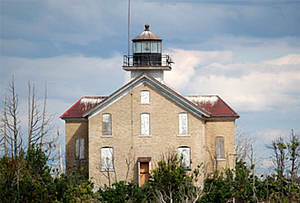 A square tower projected from the roof at the western gable of the house and was topped with a ten-sided cast iron lantern containing a fourth order Fresnel lens. 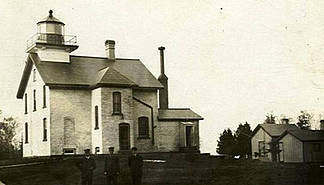 The base of the tower was 11 feet above lake level, and the focal plane of the light was 46 feet above lake level. Because of the frequent fogs in the area, in 1864 a fog signal consisting of a trumpet blown by means of a caloric engine went into operation. After many complaints about the poor quality of the fog signal, in 1875 the Lighthouse Board erected a more powerful steam siren a the station. In the official reports in 1875, the location of the Port du Morts Light changed from Port du Morts to Pilot Island, as it is known today. Because of the time it took to recycle the steam engine and get steam up, and because of the need for a back up in case of repairs, a duplicate steam siren was erected in 1880 in its own separate building. Earlier a boat house and landing had been built on the east side of the island. Because of the exposed position of the station, it was often impossible to land or leave Pilot Island for days at a time. In 1891, a new pier and boat house were built on the west side of the island. This helped, but there were still times that Lake Michigan made it too rough to land on the island. Later various different fog signals were used until 1904 when a compressed air system replaced the old steam-operated signals. The dwelling was then enlarged to provide separate quarters for the keeper and first assistant. Each had an entrance,stairways, five rooms, and a cellar. The unused fog isgnal building was converted into a dwelling for the second assistant keeper. There were also an oil house, privy barn, workshop, and several other small buildings at the station. All were connected by walkways. In 1962 the fog signal was no longer considered essential to assist shipping and it was removed. At the same time the station was automated. Today the grounds are overgrown and only the dwelling and empty fog signal house remain as reminders of the days when faithful keepers manned the station, making sure the light shown out through the dark; and the fog signal sounded when the fogs obscured the passage.